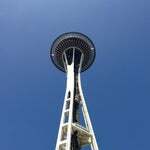 Built for the 1962 World Expo, Space Needle distinctive structure, rising 600-plus feet above Seattle Center , has since become Seattle's most famous landmark. Everyone should go to the top of the Space Needle at least once in their life! Take a jacket and enjoy the views. Turn off your flash though! Make this 1 of your 5 places to check in to get the Seattleite badge! See the list for the other venues. Messi visited here prior to taking on the Sounders FC at CenturyLink Field in front of 66,848. Went to the top of the Space Needle on a sunny day and took tons of photos. 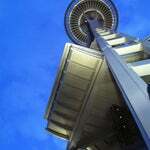 Icon of Seattle - great view of the city from the Observation Deck. The gift shop has a nice selection of Space Needle/Seattle themed merchandise. 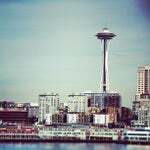 Did you know: In 2006, a WiMAX antenna was installed on the Space Needle, sending wireless broadband signals across a 5 square-mile area of Seattle. Make sure you get your free photo emailed to you once you get to the top! 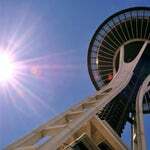 The Space Needle was originally painted "Galaxy Gold," a rusty orange color. Since it was built in 1962 it's gone through several funky changes. go to the top. don't be a tourist. Sure, it's a touristy thing to do. But the view was amazing and I'm glad I did it. If it's really windy, run around the observation deck. lean forward with hands in jacket pockets to float. Do not look in the windows. Go to the space needle restaurant (best time is just before twilight). Eat anything for dinner - nothing is specifically good - but don't forget to order dessert. The views are amazing! be weary if you're afraid of heights! 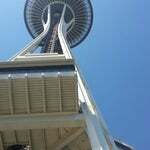 The Space Needle is a must see attraction of Seattle! Take the Link Light Rail next to the DoubleTree Seattle Airport and it will take you directly downtown Seattle! Don't forget your camera! Entrance fee is 19$, but you can go to restaurant which is required 25$ minimum bill and observation desk entrance is included!!! Don't wait in the line, use self check-in kiosk!! It may not be the tallest building, BUT it's pretty rad. It's got a great elevator you can look out of while you zoom up and hear facts about it. It's also got a rotating restaurant! Leave your purses at home hoes! Have dinner at the space needle!! Make reservations in advance for dinner. If you eat in the restaurant you get free admission (saves $16/person)...dinner runs $40-$60/person for a main dish. If it's a sunny day, try and get up to the observation deck just before sunset. Amazing pictures. 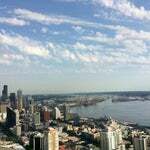 Check out the Columbia Center for a better view of Seattle for a quarter of the price. 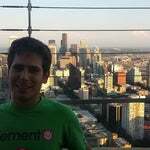 Fun employees and it was a beautiful day to see Seattle from the top! Instead of paying the pricy fee to go to top, enjoy it from below. Great picture op when sitting at the mural near the center house. More impressive than actual view from top. Go up to the top right before sunset on a clear day. that way you'll see the best sunset ever and get to see the city at night. Bring a coat and go to the restaurant. The ticket up is normally $19...so why not eat at the restaurant with a $25 minimum and a free ride up. Essentially, $6 lunch for a great lunch. Make sure you visit the Collections Caf� in the Chihuly Garden and Glass Museum at the base of the Space Needle. No visit would be complete without a trip to the top! 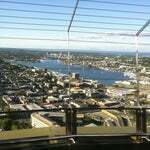 For $16, you are transported to outdoor/indoor observation decks via a windowed elevator to see Seattle from above it all. This is just the most over glorified fancy gift shop to ever exist (landmark) psshaw! Views at sunset are spectacular, but come early or late if you want to avoid lines. Get a souvenir photo taken before you board the elevator, they're fun to look at upon returning to the ground floor. Ride to the top, and if you're feeling like a luxury, have dinner while you're there. It is a magnificent view, but I recommend bringing a sweater because it can get pretty windy up on top. In addition, if you want a snack, I recommend the clam chowder, which is homemade daily. Take 360 video as you walk around the observation deck to make your friends from back home jealous! Awesome view from the top, day and night. Try the duck ride while in the area. Besides being an observation spot with great views of the city, the space needle is just pretty to look at! It's an easy landmark to spot. Also check out EMP and Science Center right next to it!
? Great views at sunset if it's a clear day in Seattle! Google 'sunset in Seattle' and go up 30 minutes before. 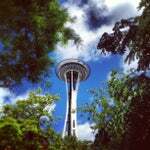 If you are into the touristy stuff, you may as well visit the space needle. Not my cup of tea, however. If the tomahawk steak is on the menu, ask your server to reserve one ASAP. Then look at the menu. They go fast. Best steak ever! Big enough to share. One of the best spots in the city to pop the question! 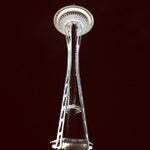 From a distance, it looks like a flying saucer on a tripod, and when it was built for the 1962 World's Fair, the 605-foot-tall Space Needle was meant to suggest future architectural trends. Pee first. If you have to pee at the top, use the YELLOW RESTROOM. And be nice to your Elevator Operators. Lines are long on weekends and cashiers lie about wait times! Very easy to get to the top. But expect a long confusing line to get down. Be sure to say hi to elevator operator Aisha, the single RUDEST employee we've EVER met at a tourist attraction. Nice job! Go up 30 minutes before sundown to see the city from above in both daylight and the city lights at night by hanging out while the sun goes down! Wear your contacts so that you can see thought the telescopes properly. Great place to go at sunset. Best way to see Seattle. You can also grab the monorail to/from downtown shopping area if you don't want to walk. DJ Latin Prince ? ? If you come to Seattle and don't come here you are missing out! 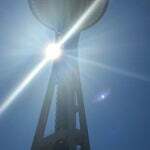 The Space Needle Skybeam shines skyward from the top of the tower on special occasions. It's powered by lamps that total 85 million candela that can be seen up to 30 miles away! Fourth of July Fireworks from the Space Needle are Glorious! The egg-white omelette with prawns and avocado was delicious!! Skip the tour and enjoy the nice surrounding parks. 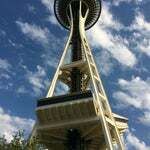 Download the Space Needle app on their free WiFi. Check out the large space spots on the floor. But seriously. This is the worst place on Earth. I would rather be in Afghanistan. 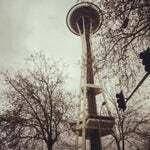 This space needle is a space nightmare!! Telescopes are free on the inside of the space needle. I could see people on the sail boats.very cool. Tickets are discounted if you tell them that you were at the Chiuily garden think that day. Or vice-versa. Try to be one of the last on the elevator � that way you can see out the windows on the way up! SkyCity Restaurant is the best place to view the entire city and includes your observation deck access. It's a nice panoramic view, but Kerry Park around sunset is better. 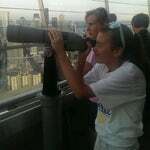 Take your time and look into the binoculars provided all around. Amazing area! 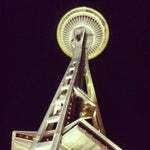 I fell in love with the 360� restaurant ! I definitely wanna come back! En la noche est� incre�ble!!! Get here just before the sun goes down and then you get best of both views. HOLLA! Come here for the history, not the view. Go with someone you enjoy spending time with otherwise it's a drag! 400 Broad street- definitely a "can't miss"! The 360 views are great but the cruise offers better photo ops and an unobtrusive view of the city skyline compared to the needle. At peak times, pay the extra $12 for a VIP ticket in the group tickets line. It's the only way to avoid the DisneyWorld style lines. Park in Pacific Place and pick up the Monorail at Westlake Center. It's not the best view in Seattle, but if you're only here for a little bit of time its worth doing. Compren elotes abajo del edificio! Yum yum! It's not amazing, but it's interesting. Everyone should do it on their trip to Seattle. Be sure to buy the combo ticket with the Chihuly Garden and Glass. The general ticketing line and the self ticketing line move at roughly the same pace. Space needle line is terrible. There is absolutely no order at all. If you get a timed ticket just get in line, any line. No one cares who has waited and for how long. Go early in the morning its quite and relaxing , send ur photo by email to urself and friends. . Better on clear days but go when it is raining- no lines!! Worth the money to go up to the observation deck! Beautiful views! The glass exhibit next door is more impressive. Bring a sweater with you. But the views are gorgeous! If you're dining, try the Lunar dessert! It's got dry ice and quite the presentation! Have dinner in the restaurant and you go up for free. Those savings go a long way toward paying for your meal. Love being home. That is why we call it the Space Needle of Joy. Makes ya smile all the time. Afterwards stop by Kerry Park to take in best view of the Space Needle and Seattle. They'll take your picture before you go up and there are kiosks above where you can select a background and email yourself a copy of he picture for free. Fun! Nice views for a wedding! It'll probably be cold outside. Never been a fudge fan. Visit Santa at the Space Needle. He's dressed right out of The Jetsons and his sleigh is a spaceship. You can go to the top for free! Make a reservation for the restaurant at the top, which allows you access to observation deck for free. Then just go up & leave without ever going to the restaurant! Go after 5 just when the sun is about to set so you get both the day view and the night view in one trip! Awesome! 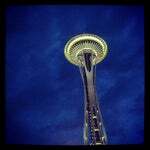 Space Needle - Seattle Center, most famous landmark when you come here. Pee BEFORE YOU GO UP. Website says open at 9am but it opens at 10 and not friendly ticket sellers. Save $$ by buying a Chihuly Glass and Needle tickets together! Not as tall as I thought it would be. Celebrating its 50th birthday this year, the Space Needle was built as a monument to science and technology. At the observation deck, visitors can dine at the beautifully retro Sky City restaurant. This is a nice place 2 go 2 in Seatle, it is cool. Get the 4sq Seattleite badge! Had so much fun with my kids! 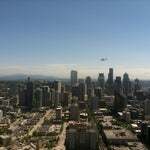 Beautiful 360� views of Seattle! Get some ice cream at the top! Pop Pinguino's bubbles from the top of the space needle. Wear a warmer coat & gloves!!!!! Its COLD BE..tch!!! It takes a little under three hours to walk to the Space Needle from the Northgate Mall at a leisurely pace. Definitely worth it tho, this thing is tall! 50 years young this year... Yeah, baby! while youre here, visit the Experience Music Project museum right beside the needle! take a panoramic photo at the top! Enjoy the view from 520 feet with someone special. 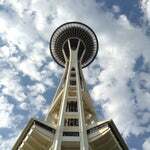 The Space Needle is 605' tall and was built for the 1962 World's Fair. If you're a AAA member show your card and get a Day & Night pass for only $22 - that's $4 more for a second trip up! Get the Seattle City Pass. It includes two tickets to the top of the Space Needle: one for the daytime and one for the night time. Got a little weak in the knees on the elevator, but was "okay" at the top. If you go on a day with good weather, be prepared to wait in line for quite a while. The salmon is OUT of this world! The staff amazing at truly making a night special! Despite some bad reputations, I've dined there many times to much delight. The salmon and crab cakes are out of this world. Do not forget the Fremont Troll, Gasworks Park or Underground Tour while in the area. Not worth the $18 to go up to see a view of the city and Mt. Rainier. A day/night pass is included in the Seattle CityPass so you can see the view over Seattle by day and also look at the pretty lights at night. Sunset is a popular time to visit. It is nice to go to the top of the Needle, late in the day to watch the sun set and stay up there as it gets dark and watch the night lights of Seattle light up the skyline. Spectacular! Had the burger at the restaurant for lunch ... it was amazing!! Ah-mazing view of Seattle. Well worth the admission. Take a picture, you can customize it and email it to yourself. Un lugar que debes visitar! There is a great picture spot across the amphitheater near the entrance to the Pacific Science Center. Don't wait in line! Buy your tickets online with your phone and go to will call to pick them up. Beat the ticket line by using the self serve kiosk. Stand a block away and take a picture holding your finger out like you are holding it up! Pay the extra $14 for the VIP pass to bypass the 50 minute line. 100% worth it.